I’ve been trying to bring more veggies into my life. It shouldn’t be that hard; I genuinely love vegetables, I’m surrounded by awesome stores with plenty of fresh produce and I have access to an amazing farmer’s market every Saturday. I even have plenty of kitchen space to cook in. Yet somehow, this whole vegetable thing hasn’t been happening for me. Cooking every night isn’t realistic — I don’t always have the time and I don’t always eat at home. Doing daily salad lunches from one of the many CBD salad bars isn’t sustainable either; one can only eat so many raw veggies (no matter how delicious Janus might make them) before craving something hot and spicy. Next thing you know, you’re sat at a communal table, slurping down a giant bowl of laksa at Malay-Chinese takeaway (and no, coconut milk doesn’t count as a vegetable). Anyway, the good news is I’ve found a solution. Are you ready? Roasting! 5. It’s quick — as quick as 10-15 minutes for zucchini or summer squash. 3. It requires minimal clean up — line your baking tray with foil and toss it out when you’re done roasting; no pots to wash or pans to scrub. 2. It works at any scale — roasting veggies for two is just as simple as roasting for a crowd. 1. It’s delicious. Duh! If you’ve ever been turned off by an overboiled asparagus spear, a mushy broccoli floret or a soggy Brussels sprout, now’s the time to give this awesome cooking method a go. Roasting vegetables at temperatures above 400F / 200C caramelizes their exterior while keeping their insides moist and tender. This not only gives your veggies that wonderfully contrasting texture as you bite in, but it brings out their natural sweetness. Roasting also enables some of the water in the vegetable to evaporate, resulting in a more intense, concentrated flavor. Yum! Ready to roast? 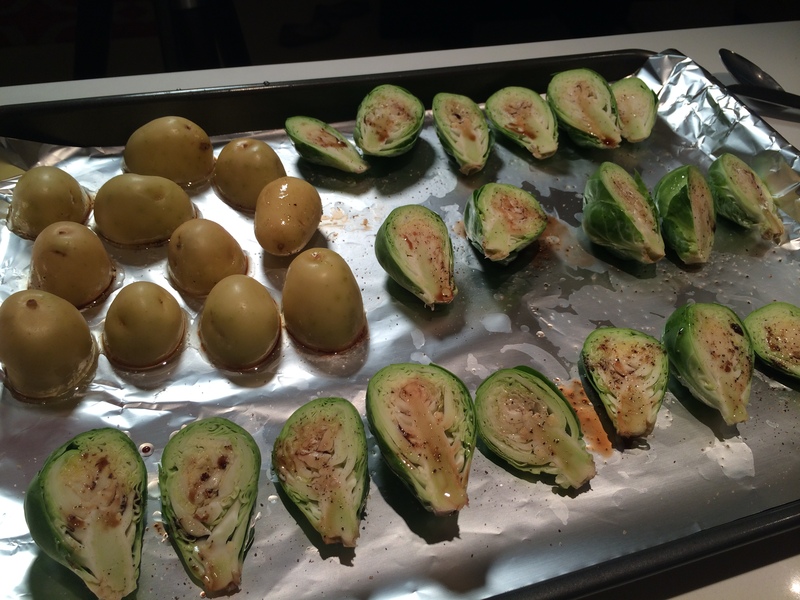 Here’s a quick recipe for roasted Brussels sprouts and potatoes. The whole thing will take 30 minutes. Line a baking tray with foil. Set your oven to 400F. 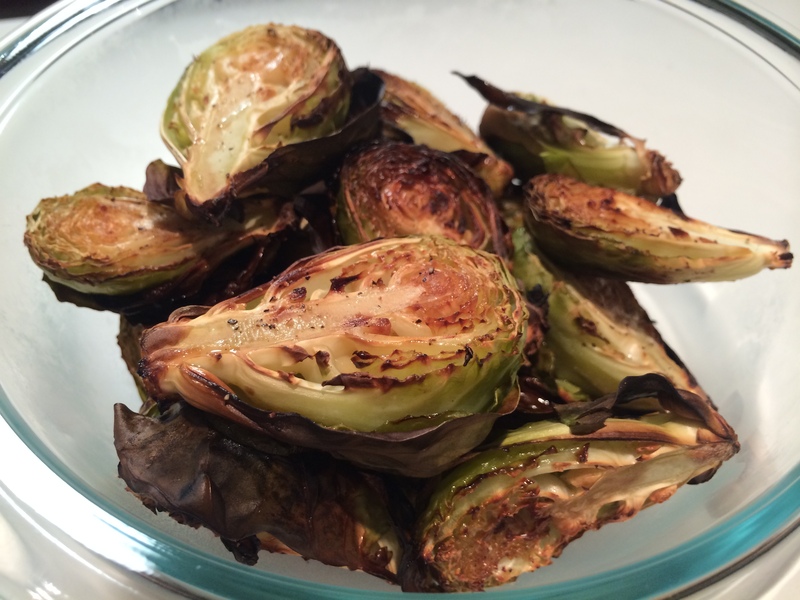 Prep your veggies: give the Brussels sprouts a good wash and check that the outer leaves are clean. Slice them in half lengthwise. Wash your potatoes and either cut them into similarly sized pieces or leave them whole and poke a few fork holes in them. I used very small young potatoes because they don’t need to be peeled and they cook as quickly as Brussels sprouts (win!) but you can use whatever you like. 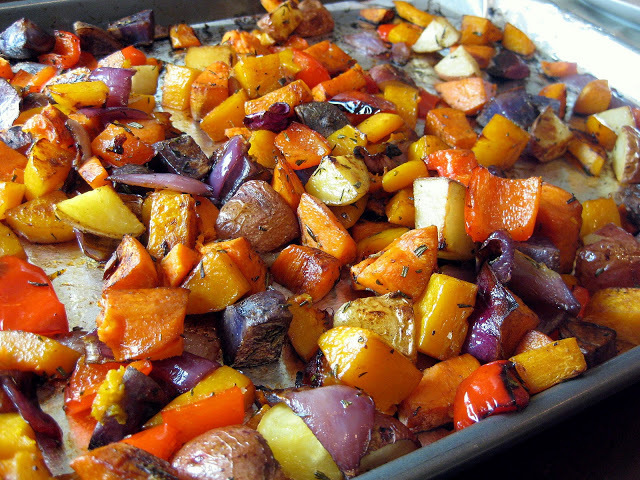 Fingerlings and sweet potatoes both work beautifully with roasting. Arrange: it’s very important to lay your veggies flat on a baking sheet with enough space between them. Don’t pile them on top of each other and don’t pack them in! Doing so will restrict the airflow between them and result in more of a steaming effect rather than roasting, and your veggies may end up soggy. For this reason, it’s also important to use a baking sheet rather than a Dutch oven, casserole or some other deep sided dish — the baking sheet allows for air exposure from all sides enabling the perfect roast. Get your basting mix ready: I throw some olive oil, salt, pepper and herbs (rosemary and thyme are great here) into a little dish and shake well. Arrange your veggies on the baking tray and drizzle the mix over the veggies. You can toss to make sure they’re well coated or you can use a basting brush. Some people like to add balsamic vinegar (experiment above) or brown sugar to the basting mix. I prefer to add a touch of garlic. Now, it’s important to note at this point that olive oil is your friend: coating your veggies in oil will ensure that they brown evenly, cook faster and don’t dry out. Olive oil also makes it easier for your body to absorb many of the fat soluble nutrients contained in the vegetables. Still, no need to go overboard. Pop your tray in the oven, sit back for 20 minutes and wait for your veggies to roast. When the veggies look like they’ve caramelized, pull out the tray (with a thick oven mitt), grab your veggies with tongs, serve and…profit. Awesome! Clearly I also love Brussel sprouts 🙂 Unfortunately I think a lot of people have been scarred by how smelly they get when they’re been overcooked or when they aren’t fresh.